I finally bit the bullet and finally finished February’s blanket. I couldn’t have March’s blanket done first now. That just wouldn’t be right. February’s blanket was actually the first blanket that I started this year but the second finished. 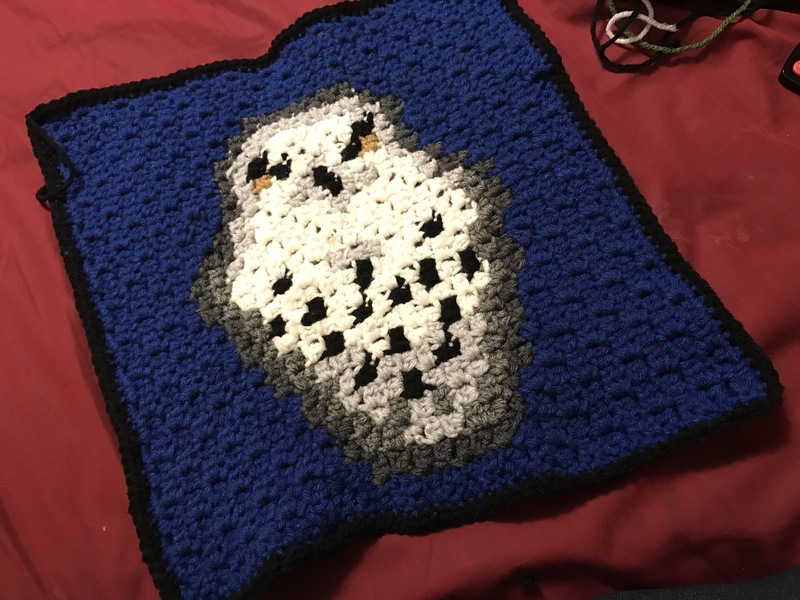 I started mid January then took a break to make the Ravenclaw blanket in January. So the Ravenclaw blanket got finished first. 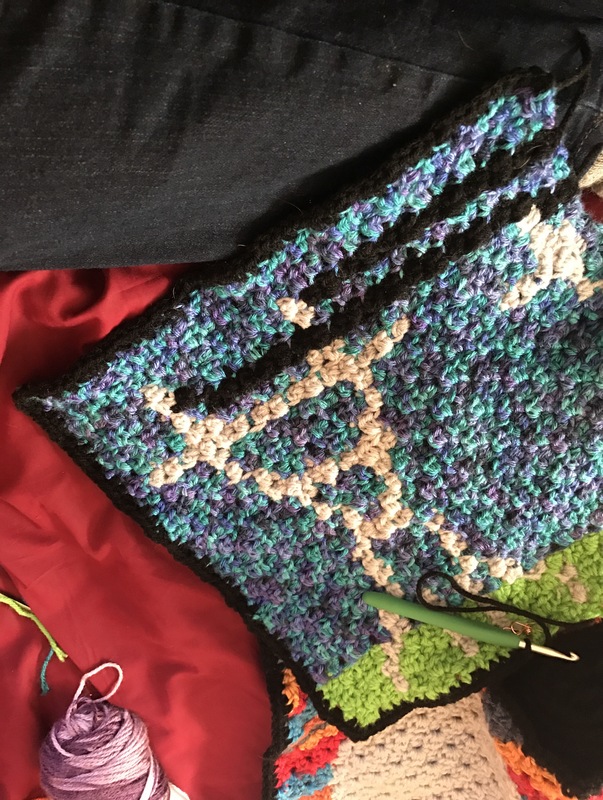 Then I needed a break from my last square so I started March’s blanket. Well it’s getting toward the end of March so I figured I’d better go back and finish February’s blanket. This blanket was crocheted in mini c2c. I used Red Heart Super Saver yarn. Each small square takes about 4 hours if you don’t have interruptions like children or a dog. I have both. The large square is equal to 4 small squares. So it should take 16 hours. I wish! It took a bit longer. Finishing the Hogwarts crest felt like a big accomplishment. This is the blanket that started my quest to make twelve blankets in twelve months. I saw the pattern on www.twoheartscrochet.com and fell in love. 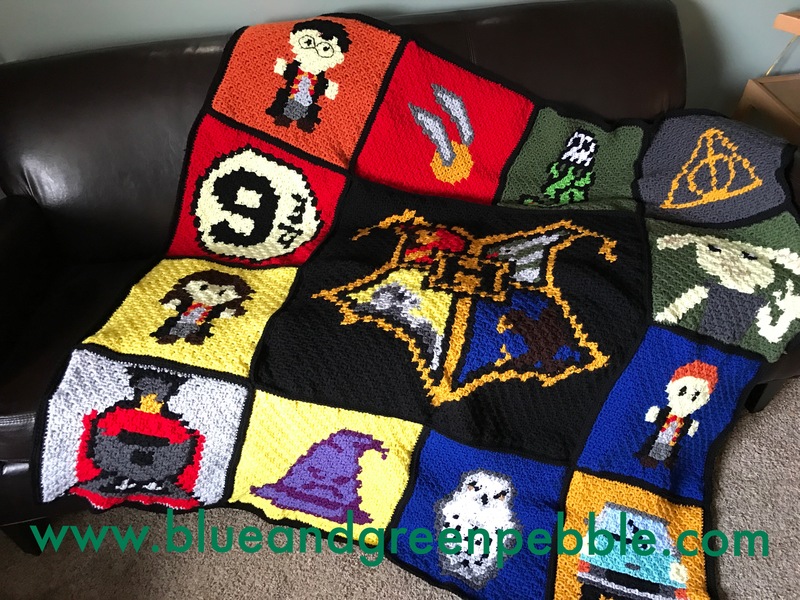 If you’d like to make your own Harry Potter blanket, go visit their wonderful website. I love how the blanket came out. It will be hard not to drag it with me to Florida and take pictures with it all over Diagon Alley and Hogsmeade at Universal Studios and Islands of Adventure on my next trip. I could get the coolest pictures on the Hogwarts Express. My husband was awesome and spent yesterday weaving in tails I missed. I’d also like to thank the baristas at my local Starbucks for being so encouraging. They have been so excited to see my progress on this blanket and kept me supplied with caffeine to keep working. 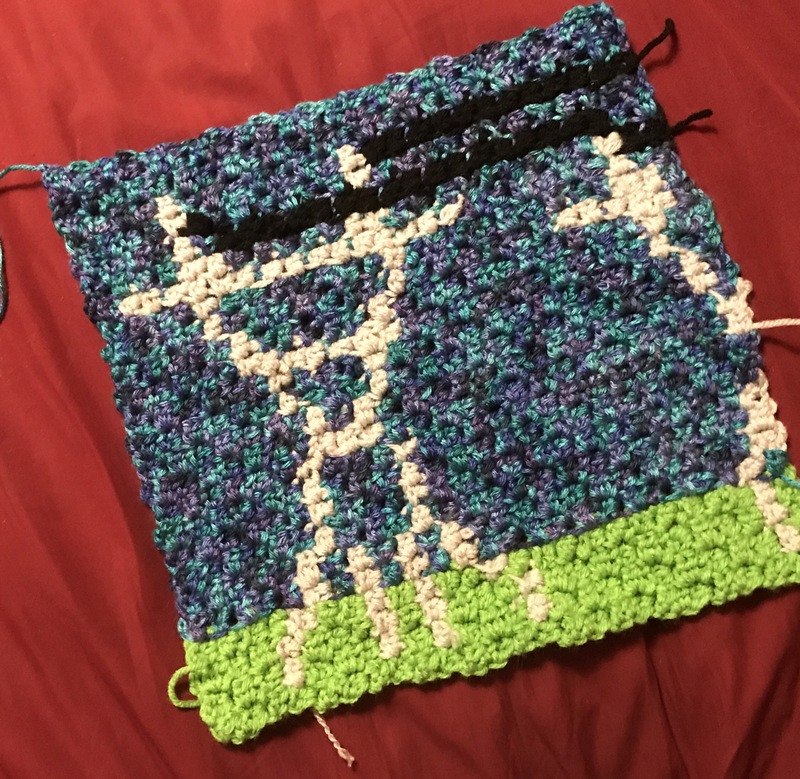 I broke down and finally finished the last square for February’s blanket. I’ll assemble it tomorrow. I figured that I should probably finish February before March and I’m almost done with March. Something about this square took what felt like forever. The pattern for February’s Harry Potter blanket is available at www.twoheartscrochet.com. I wonder how I should celebrate finishing my second Harry Potter themed blanket. I think I’ll celebrate by going to Diagon Alley and Hogsmeade and get myself a butterbeer. I’m going to be crocheting twelve blankets in the next twelve months. Coincidentally I have twelve people in my life that I need holiday gifts for. I started a little bit late. My first blanket was started in mid January. I finished it February 2. This was my very first C2C crocheted blanket. I hadn’t even crocheted until December for about two decades! The pattern came from Two Hearts Crochet. It is a Ravenclaw House blanket from Harry Potter. In the books, Ravenclaw colors are blue and bronze. In the movies, the colors are blue and grey. I chose blue and grey to match a Ravenclaw scarf belonging to the recipient. It also didn’t hurt that I had blue and grey yarn sitting around the house.